The device the reviewer is referring to is this one. Dental health is a precious thing and it is not something that we should trifle with. Expensive treatments are not fun, both financially and with regards to the pain factor. Dental work generally does not last forever either. At some point it may need to be 'redone' adding to the cost, time and suffering. Prevention on the other hand, may be able to free you from some of that burden. Would it be worth it to save thousands on your dental health over the next decade? I think it would. You can tell me if I'm wrong about that. Read this now and let me know what you think. Dr. Cardenas Andres Reminds Us That Drinking Water Is Good For Our Teeth! It appears that staying well hydrated has an impact on your teeth as well as the rest of your body. I remember reading about a book called The Water Cure. It was about an Iranian doctor who had been imprisoned and while incarcerated he discovered how water was able to help stop or alleviate a lot of ailments. It is a quite interesting book. So, now we are reminded by Dr. Andres that water is also good for the teeth. They say we are 70% water, so that makes sense. Drink more water and help to protect and preserve your dental health. Thanks to Dr. Andres for the reminder. Plaque and tartar are the enemy. Don't let them get the best of you. Keep the plaque and tartar buildup reduced between your regular dental cleanings. Shown to do just that: The Hydro Floss. Protect your families dental health. A single lost tooth and implant can cost big time - Perhaps over $2000 in the US! Gum disease causes lost teeth. It's the biggest cause! Gum disease bacteria grow rapidly under the plaque and tartar. Reduce the plaque and tartar build up between your regular office visits! Prevention Doesn't Pay - That's what a doctor told me once. He gets paid when people have a problem that requires treatment. If you prevent the problem, then that reduces his ability to get paid. I think that is a very narrow viewopoint. There will always be more people. Even if you spend all of your time teaching prevention, only a small number of people will pay attention and an even smaller amoung will successfully carry out and achive prevention. Therefore, I don't believe any of the professions will suffer much, if any, from people preventing problems and staying healthy. The reality is, no matter how healthy people seem today, they might get sick next month. On the other hand, from the individual's perspective, some things are preventable, and it can save them money, pain and hassle but engaging in a little prevention now. What is that old saying? "An Ounce Of Prevention Is Worth A Pound Of Cure?" There will always be people with health problems, so no doctor or dentist should be concerned about not having enough patients. There are people today who can't get access to the health care they need! Prevention pays the individual who is smart enough to engage in it. How much does it pay? Is an ounce of work now worth a pound of money, pain and suffering later? Many dentist lament the fact that their patients don't brush and floss enough. Both of those activities are very important. In addition to doing both of them, someone might want to add this on a daily basis. I don't know about you, but I still believe in prevention. There is plenty of work out there for doctors. You don't often hear of a doctor that complains about not being able to get enough patients. Sometimes, you hear the opposite though: "I'm not taking any more patients". Do you agree with me that Prevention is important to YOU? Just How Serious Is Prevention For Your Dental Health? Answer: It is a very serious topic. If you don't focus on prevention, you will likely have a lot of problems to deal with over the years. Of course, there are notable exceptions. Ask any dental hygienist or dentist, they see the state of people's oral health every day. If you ask them, I'm sure they will share with you that a lot of people are headed for trouble. Many people think it is all about the teeth. But a bigger area of concern is the health of the gums. Why? Because that is the structure that supports healthy teeth. Gum disease causes bone loss and recession. When the tissue is damaged it becomes weaker. It can go all the way to the point where the teeth start to become loose. You really need the help of a good professional at that point. 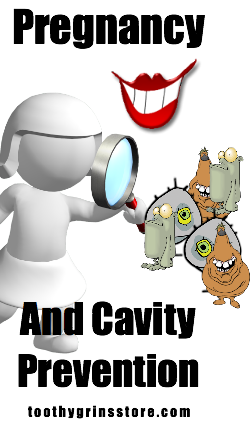 If you want to save the tooth, you'll have to look around carefully for a good doctor. This is because many will take the 'easy' path of pulling the tooth and giving you an implant or other appliance. Not that there is anything wrong with that. It all depends on what you want as the patient. If you ask the right questions, you may find out that there are alternatives that may not have been initially presented to you. Remember, it is perfectly ok to get 2 or 3 different opinions. You should too, because the difference in costs, pain and length of treatments can be substantial. There are many good dental professionals out there. The right one can do wonders for you. Take some care and pick a good one! Many people either don't know or don't fully understand what it takes to keep their teeth and gums healthy. Brushing and flossing are not always enough to stop problems from happening. We know that is true because about 75% of people, according to many professionals, have gum disease. How does that happen? It is both simple and complicated. Bacteria run amok when plaque and tartar build up. Daily disruption of plaque is very important - between your regular dental cleanings. Monitoring your progress or lack thereof is also important. You have to know if what you are doing is working or not! Most dental professionals would likely agree, what you do at home is of crucial importance. Keep in mind that your dental office can only see you a few to several times a year. But your struggle to prevent dental health problems is a daily one! That's why I encourage you to take a look at the Hydro Floss. It's definitely a powerful tool for prevention. And, under the care and supervision of a professional, it can really help to mitigate existing problems! You can save a lot by doing a little more at home. 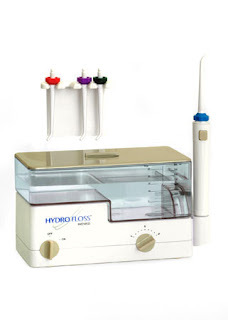 Check out the Hydro Floss now. I mean that in a nice way, I really do. So many people are busy with their lives. They don't often take time to think about their dental health and how it is really a reflection of the body's health. Both ancient wisdom and modern science agree. An unhealthy mouth is often a reflection of an unhealthy body. In Ancient days, and probably still today, farmers always look at an animals mouth before purchasing it. They intuitively understood that a sick mouth meant there was probably a sick body there too. Modern researchers continue to discover connections between gum disease (which most people have at least a little of) and many other diseases, including heart disease and stroke. Both old wisdom and modern science agree on this point. I know you get tired of hearing all those people harp on you about dental health. I used to hate that too. And I have OFTEN thought they had ulterior motives. They very well may. But, that doesn't really change the truth about the connections that exist. Take it from someone who doesn't stand to gain thousands up thousands of dollars, your dental health is important! Take it from someone, who was trying his best to avoid an expensive treatment. I was able to do so, because I developed some knowledge and I found the right tool. Part of my success at avoiding expensive treatment was from knowledge and understanding. 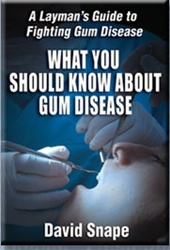 I put that in the book : What You Should Know About Gum Disease. Another part of my success was due to finding the right tool to do the job I needed done. That tool is what I call the Best Flosser. And now, I have shared these resources with you. Even though I have done that, I know you may not listen to me. Let's face it, most people are intent on following the mainstream. They will go ahead and go for the Scaling and Root Planing Treatment or the Gum Grafts or the other surgeries that will be both costly and require some recovery. They will spend a lot of money on expensive treatments. Those are the same treatments that a wise person can learn to prevent. You know what many doctors say? "Prevention doesn't pay." A doctor told me that when I told him about my book. Isn't that telling? I think it is. I can tell you that prevention does pay. It pays the patient. And it can pay off big time in savings and hassles in the future. I have an experience to share. Not just mine either. I have a story to tell. If you want to hear that story, give me a call. 1-888-586-6849. There is no obligation or anything like that. But maybe I have information that is worth hearing / learning. Of course, you always want to listen to and be under the care of your dentist. But, that doesn't mean a person can't learn things that can help her further, right? You should always get your regular cleanings and checkups. That's important. But, even most dental professionals will acknowledge that what you do at home, every day, and between office visits, has the greatest impact on your dental health. Greetings From Toothy Grins Store! First and foremost, I want to thank you for being a customer of the store. I've had the pleasure to speak with many over the phone during the past several years. Others have never spoken to me in person - but in either case, you are always welcome to do so: 1-888-586-6849. 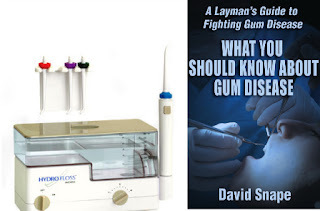 When I first wrote the book: What You Should Know About Gum Disease - I was hoping to inform more people about the dental health issues and truths that I had come to understand. I have been able to do that. And I hope to educate more people as well. Since we all know the most powerful and effective tool is the Hydro Floss, here are some helpful links. It would be great if more dental offices would send their patients directly to ToothyGrinsStore.com It saves the hassle of stocking and customer service. We can provide that for them - as you know. Thank you again for being a customer. I came across this pamphlet on gum disease from Ireland. In the Irish 'leaflet' (which is what they refer to it as) they say that gum disease afflicts about 4 out of every 5 people worldwide. That's about 80%. In the United States you hear various numbers with 3 out of every 4 or about 75% being the most common statement. In either case, and regardless of which statistic is more accurate, gum disease is a serious threat to both dental health and the body's health. So many people have gum disease and don't know it, that it is truly a shame. If you asked most people, they would say they don't have gum disease. Yet, in Ireland dental professionals are saying 80% of people do! In the US, it is commonly stated as somewhere between 40 and 75% - most commonly 75%. It makes no difference if it is 4 out of every 5 or 3 out of every 4 people - it is a LOT of people. Even if it is as low as 40% or 4 out of every 10 people, that is still a lot! If you are reading this, I hope you are inspired to learn more about gum disease. Read about how it is threat to your health and your family's health. Learn everything you can about preventing it or mitigating it once you realize you have it. Of course, I can only speak in general terms here. Specific questions about your own unique situation should be addressed by your dentist. This is such a serious problem and so many people have underestimated it. Don't be one of them. If you are a dental office or dental professional and are interested in giving your patients access to this fantastic tool, give me a call at 1-888-586-6849.